Situated a short drive from Silves in an area called Cumeada, Quinta Vista da Montanha sits on top of a ridge giving it stunning views all around the property. The design ensures these views are available in every room and with the spacious open plan living area at the top of the house the fabulous vista of the rolling countryside can be enjoyed overlooking the large infinity style pool below. The views are complemented by water feature ponds to the front and rear that are set within beautifully landscaped gardens. Inside the villa is tastefully decorated with interesting local artwork throughout and the owners have thoughtfully provided a small selection of books, DVD’s, CD’s and traditional board games for guests to enjoy. With plenty of seating areas, covered terraces, including a shaded poolside dining area, this is undeniably a very special house in a most beautiful an unspoiled part of the Algarve countryside. Approximately 15 kms from the beach and 8 kms from the shops. The driveway leads past ornamental ponds to the house at the 1st floor level. Entrance hall with large marble staircase, leading to lower levels, seating area, guest cloakroom. 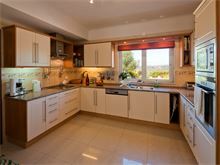 Modern and very well equipped kitchen with built in fridge/freezer, microwave and oven, hob and dishwasher. Utility room with washing machine and dryer and extra fridge/freezer. An archway from the kitchen leads to the dining room which has glass doors to the large top terrace and glass doors into the sun room to the side. 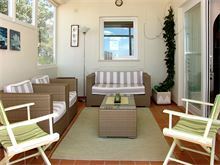 The terrace has two shaded areas with both outdoor casual seating and dining areas as well as ample sunbathing space. 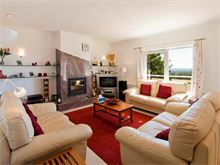 Lounge with wood burning stove, flat screen TV and sound bar, DVD and CD. The master double bedroom has glass doors to a terrace and outdoor shaded seating area and double shower en suite. Wide marble steps lead down from the entrance hallway to a lower hallway and sitting area, 1 twin bedroom (can be made up as a double upon request) en suite with bath and shower. 1 double bedroom with bathroom en suite with bath and shower. Both bedrooms have glass doors to the lower partially covered terrace. The house benefits from air conditioning which is included in the weekly rental price (individually controlled in each bedroom and only available between 5pm until midnight in all other areas). Maid service 3 times per week. Pool heating and Wi-Fi are available at extra cost, if required. This villa has it all. 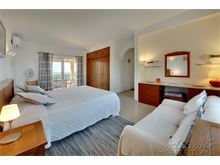 It is set in the most beautiful, peaceful location close to Silves, a gorgeous medieval town with lots to offer. You need a car but it's only 30 mins to the coast and both west and central Algarve are easy to reach. 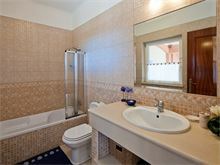 The villa itself is fully equipped, everything we needed was there and more. The beds are comfortable and there is so much space. There are lots of steps so it would be difficult if you have mobility problems. After a day at a busy beach or town, it is so lovely to come back to and chill out. We had an amazing time here with our 2 teenage sons. This villa is very well appointed. Easy to find and with lovely views to front and rear. The inside is spacious and very well maintained. 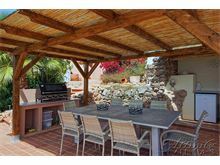 The outside has a variety of terraces, a good sized pool, gardens and land surrounding. The impression given at the rear is of a holiday resort with all the facilities laid on including a barbecue and eating area by the pool. The location is peaceful and private without being cut-off. Excellent. Quite the best villa we have stayed in. 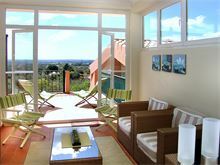 This was one of the best villas we have stayed in, very clean and well equipped with everything you could possibly need. The villa is in a countryside setting and is a good distance from anything, so a car is vital. 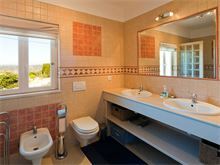 The villa is very well equipped, and is very comfortable, with a lovely pool. Two couples shared this villa for 2 weeks and were sad to leave. The standard of cleanliness and the facilities were outstanding. You could come here with just a swimming costume and a box of beer and survive. We love to cook and the kitchen was fantastic with every convenience. The BBQ are outside with fridge and sink was excellent and we used this area a lot. Yes you do need a car as it’s a good 10 minutes drive to Silves but that is the price you pay for being able to skinny dip in a warm (we payed extra) infinity pool under the stars. The Affinity Villas team were excellent in their correspondence and information. We 4 would thoroughly recommend both the company and this villa. Just brilliant. This was our second visit to this villa, so we obviously like it! It is quite a way from any amenities so a car is essential, but that is part of it's attraction for us. It is a very nice villa, homely, and the pool is great. A fabulous and relaxing holiday in fabulous surroundings. 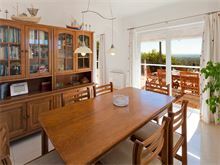 The villa is quite remote but near to all amenities and restaurants in Silves. Well equipped kitchen meant a lot of good meals at the villa. Very clean and tidy with well spaced out facilities, good sized rooms and plenty of outdoor space with an excellent pool. Great views over to the sea. A beautiful villa, set in a magnificent location with incredible views all around. The villa itself was well presented with every thing you would need for your holiday. The sounds of the countryside was full of music, from the sounds of peacocks, donkeys, to the spell-bounding melodies from the frogs in the pond. Access to supermarket and towns were very easy. We will be returning. This was a real home from home property from the moment we walked in. Comfortable, spacious and well appointed. Lovely location in the hills behind Silves. There were no drawbacks for us but you must have a car to get around and to shop. Excellent and friendly house staff. If we go with a villa holiday again we would definitely use Affinity and strongly consider this property again. Very nice villa peaceful with a good pool. Need a car as it is on a ridge in the countryside. Family of 4 with older kids and all enjoyed it. A lovely house with excellent views. Well equipped. There are 33 steps from the ground floor level to the pool with landscaping and seating in various locations. Friendly and helpful maid & staff. Excellent location if you don't need every facility on your doorstep. A real home from home with a view one can never tire of.